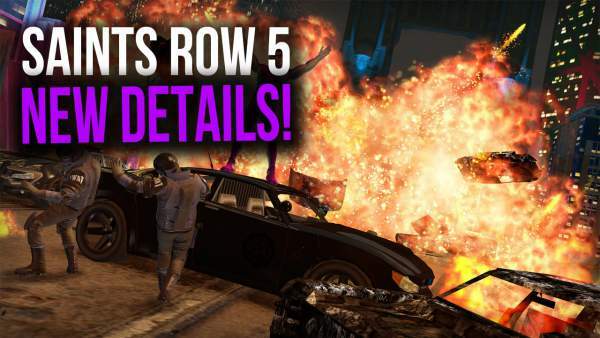 Saints Row 5 Release Date, Cheats, Characters, Game News & Updates: In 2006, when Saints Row was launched, it was more than blockbuster in the world of Video Games. The game was created by Volition and published by Deep Silver. Almost every lover of action-adventure video games had this in their favorite list. The story is similar to the other action-adventure games. It is oriented to the gang called Third Street Saints and their adventures and misadventures. This game has nonlinear gameplay, consist of action-adventure and racing sequences which was unique among the popular video games of that time. The second part of the series viz. Saints Row2 has come in 2008 followed by third and fourth installment in 2011 and 2013 respectively. The franchise has not maintained any specific pattern of the release date for the next in the series. Hence, it is very difficult to speculate when the Saint Row 5 will come out in the market. The extension of the fourth series named SaintsRow: Gat Out of Hell came out in 2015 and after that everyone was expecting that fifth installment (PSP game SaintsRow Undercover) will release in 2016, but Volition had canceled this release for the PSP. We don’t know if it will ever happen or not. There are some reports making round on the internet that there would be microtransactions along with the much requested multiplayer mode in the upcoming sequel. SR has been a single player game franchise so far. It is sure that the game will get a number of customizations to engage more gamers. Volition has been facing some major setbacks since the last few years. So, they might not even be planning for the next title in the franchise. However, there is always some hope for a sequel. It appears that the company has lost its original vision for the game franchise since they have faced bankruptcy. Therefore, the rumors on the internet are completely random. Let’s assume that Deep Silver isn’t going to come up with the title, at least for a very long time to come. In 2017, the Saint Row’s producer left the company. Now, he is officially back with the team. So, it’s safe to assume that he will be contributing to the next title, if it every comes. His comeback is seen as a positive sign towards reviving the franchise. There is a saying that where there is smoke, there is fire. As we know the game developer of this game are not anymore in partner with High Voltage Software, hence there are more chances that series 5 can delay up to 2020. But still, we need to hope for the best. There is also doubtful situation whether Koch Media owned Deep silver will buy this series for $22 million just to get one game and one standalone expansion made but Deep silver can purchase it for the marketing. Related: Elder Scrolls 6 Release Date. However, the game will most likely be a reboot, It is a good time to reboot the series because the head writer of SaintsRow franchise is leaving this series. In the next series, we are expecting more better missions because previously many gamers complain about the lengthiness of the game. The old stories of the series should be the repackage. The storyline of the Saint Row 4 was very interesting and also appreciated by the gamers. And hence we are expecting more from this series 5. But the burning question of the hour is that what will be the Saints Row 5 release date. If we try to trace the previous timeline, then we should have known about release till now, but the official announcement is yet to come. So let’s hope it will release soon with its best story till date. What do people want in the fifth installment of the game series? Total revamp will be highly appreciated, taking ideas from the old grounded chaos from the previous installments. The Reporter Times will definitely update you about the saints row 5 release date.